Interested in learning about the San Diego Association of Governments (SANDAG) and their role in planning in San Diego? Join the Young Planners Group in our first Lunch & Learn of the year. All are welcome to register, space is limited. Lunch is included. 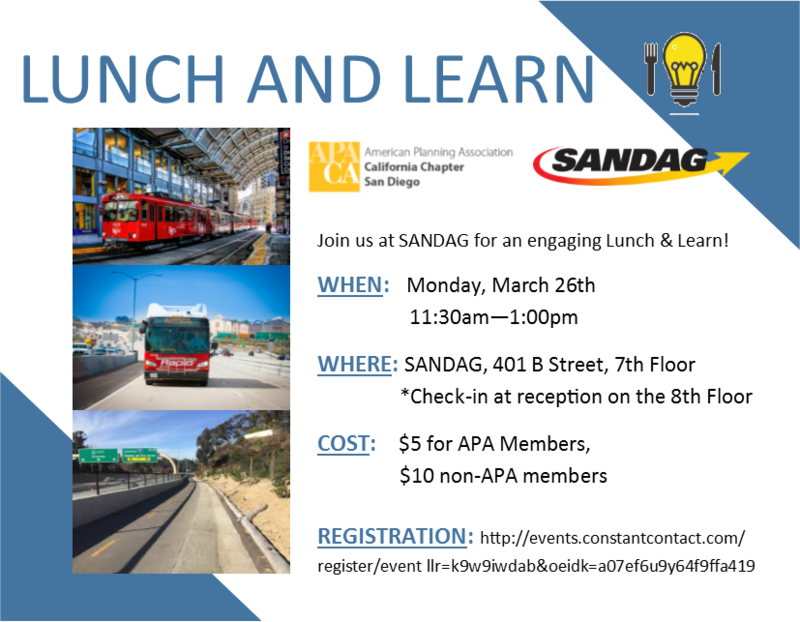 Have lunch and hear from SANDAG staff about what they do, the Regional Plan, Transportation, Land Use Planning, Climate and Environmental Planning, Housing, and much more. Please check-in at reception on the 9th floor. Lunch will be served from 11:30 to noon, with the presentation beginning promptly at noon. There is no parking validation so public transit is highly encouraged.